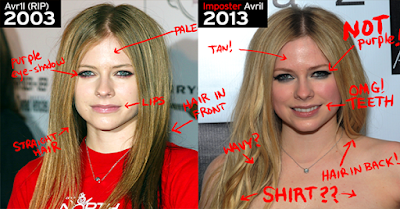 SHOCKING: Avril Lavigne Allegedly Died and Cloned by Illuminati? Avril Lavigne is one of my favorite singers. With her heartfelt songs such as, When You're gone, My Happy Ending and Losing My Grip are just among her hits. However, there are gossips about Lavigne's death and the person we are seeing now performing is just a clone. Many fans were really shocked about this news. On a website, AvrilEstaMorta.blogspot.com, there are some observations published. The site used a photo to cite some important distinguishing factors which are missing in the Avril that we are seeing now like pimple scars and birthmarks. They also pointed out a change in the height from 1.58 meters to 1.55 meters. Furthermore, they said that her voice and nose noticeably changed. According to some reports, Lavigne died due to severe depression which is clearly observed in her songs. Others say that this is just a news to challenge some netizens of their persuasion level.